Limited haori inspired coats are back! No I’m not going to insult your intelligence by calling these “samurai coats”, it would only cheapen an otherwise high quality products in my opinion, no these coats are based on the kimono men wear called haori, haori are nowadays only worn during festivities like weddings and coming of age day (the day 21 year old youngsters celebrate their entrance into the “adult” world). The men’s kimono is one stylish piece of clothing though, worthy to be worn much more often than just once a year or less. Wearing a hoari on an ordinary day would give you a lot of puzzled looks, kind of like wearing a swimsuit during winter. Fashion brand Trove introduced last year the Haori “wa-robe” with wa （和)meaning Japanese style, and it proved to be a very successful concept. selling out in a short time. This year, the lineup has been expanded to four different pieces, with the warmest being the 29,700-yen (US$288) Wool Haori, with a soft-to-the-touch wool/nylon/polyurethane shell and cupra rayon lining. While the haori is an old-school garment, the simple, understated design means that they can be paired just as easily with modern fashion as they can traditional Japanese clothing. Made of waffle-patterned cotton instead of wool, though with the same lining as the Wool Haori, this ivory-colored coat is also priced at 29,700 yen. 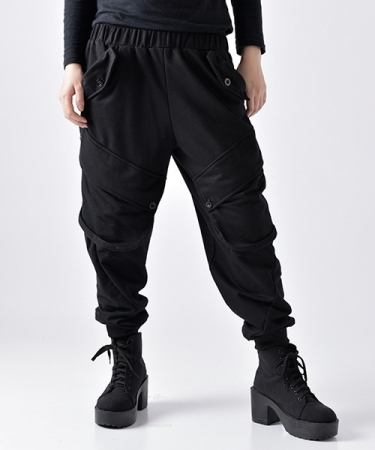 Trove is now also offering wool hakama, the loose-fitting pants. 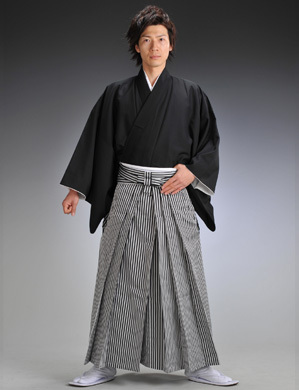 The 24,840-yen Wool Hakama feature the same wool/nylon/polyurethane material and colors as the Wool Haori. The entire lineup can be ordered here through Trove’s website, with special instructions for overseas customers found here or use the form below. Shipping is scheduled for early December. 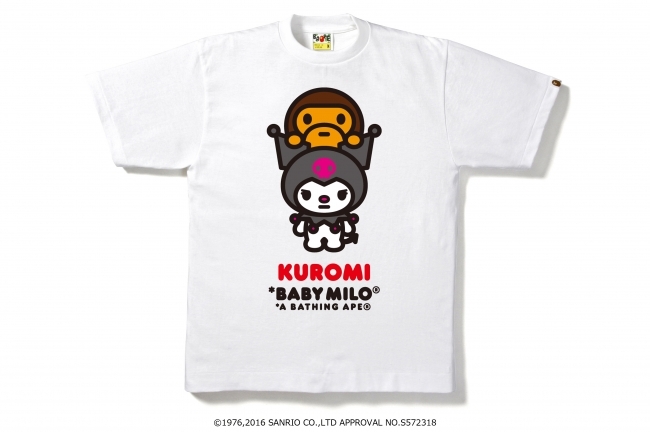 A rabbit and a monkey collaborate to create some awesome playful wear. 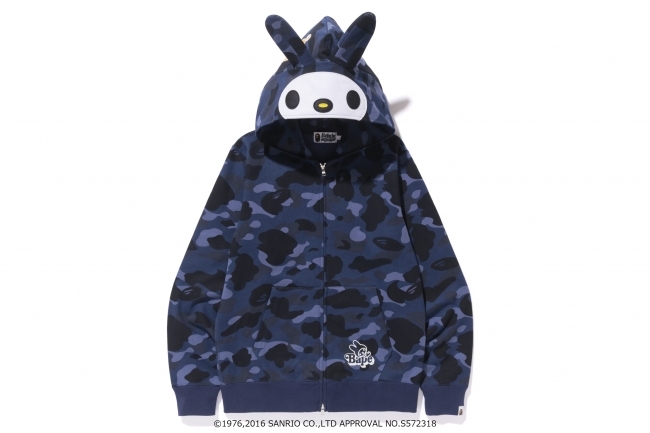 (former) Japaense fashion maker A Bathing Ape’s lovely mascot Baby Milo has found a new friend in Sanrio’s famous “My Melody” rabbit (or is it a rabbit, after Sanrio told us that Kitty wasn’t a kitty, I’ve lost some confidence). 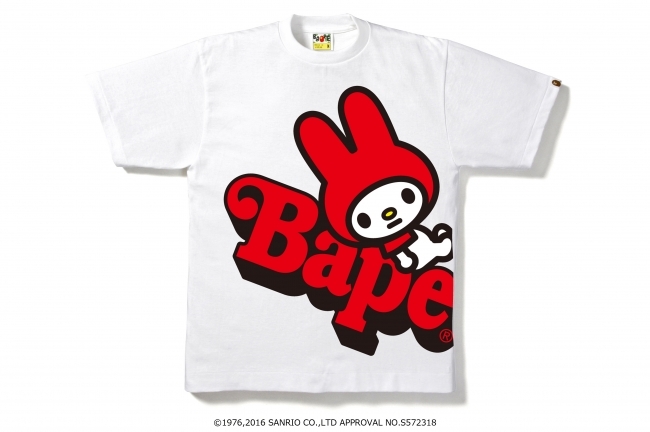 -Bape was founded in 1992 in Tokyo by designer Nigo. -Nigo got his inspiration from the 1968 film, the Planet of the Apes. -He gained fame after he asked Japanese artist Cornelius to wear his shirts on stage, Cornelius whose real name is Oyamada, got his stage name from the ape( never call him a monkey!) in…yeah, planet of the apes. 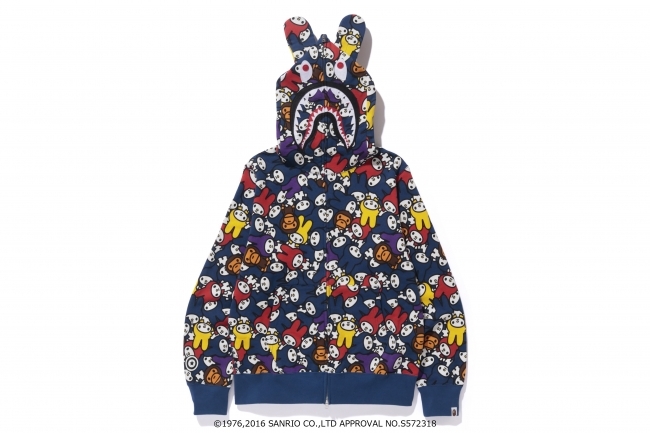 The monkey and the rabbit will feature in a collection with a wide range of items for lads, ladies and kids, ranging from hoodies, t-shirts, sweaters, towels, cups and ear rings. Sale will start August the 27th, no word yet if they will sell these products outside Japan, so just to be sure head over here and then fill out our request form and we will get it for you. Personally I won’t see myself wearing one these hoodies, but one of these shirts would look great on jeans under a black jacket, playful yet stylish. This is just one of the items in a range of delicious accessories designed for meat lovers. If you ever wanted to turn heads and make people’s mouths water as you walk by them on the street, there’s no easier way to do it than with a meaty backpack. This new product is the latest to join the weird and whacky rucksack range from quirky Japanese novelty goods store Village Vanguard, who previously thrilled us with their raw meat bag earlier this year. Now the backpack has progressed in the cooking process, developing a deliciously seared golden brown colour that makes it look just about ready for eating. ▼ The thick slab of steak comes with a pair of soft brown straps so you can carry it around in maximum comfort. ▼ And unlike your ordinary cut of meat, this one opens up to carry everything you need for the day, complete with inner pockets. Given its size, the meaty bag is a bargain at 2,160 yen (US$21.52). While it’s designed to be worn in summer, when the butter-topped serving would appear to sizzle in the sun, it’s still a top accessory for any time of the year! And for customers who prefer to keep their meat fandom within the confines of the home, the delicious steak is also available as a plump, tender cushion. If you’ve always dreamed of laying your head on a juicy piece of meat, this succulent looking cushion will give you enough meat sweats to last a lifetime. ▼ Also available in a raw meat version, the cushions retail for 2,160 yen each. The meaty range is becoming increasingly popular with customers, so if your tastes tend towards the carnivorous variety,check out the Village Vanguard online store and send us your request before they all sell out! gothic rock, punk fashion brand DrugHoney sale has started! Back in May we announced the opening of Gothic rock, punk fashion brand DrugHoney’s online web store. We are extremely pleased that our written introduction of this brand had some influence on our fashion conscious audience…clothes were ordered and shipped to the Philippines, the States,China, Korea, Canada, Costa Rica, Belgium, Italy, France, Australia, Peru, Russia, Luxembourg, Brazil and Germany, proving that people no matter where they live, don’t want to be put in a box and labelled. Those who were hesitant to purchase these awesome clothes are now given a new gateway through their summer sale. With discounts up to 50%, there is really no excuse anymore for those attracted to DrugHoney’s designs. 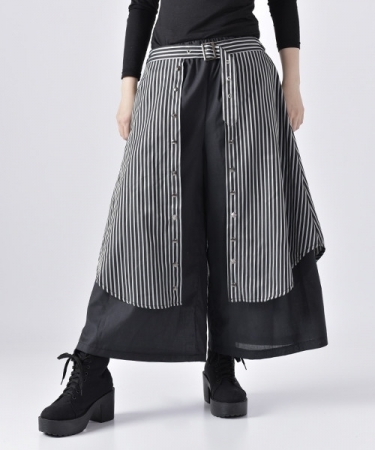 If you’re on their page anyway, we recommend you to check out their new arrivals which again beautifully tip toe the line between punk, Goth and mode! Furoshiki Shoes from Vibram designed to literally wrap around your feet are now available in new colo(u)rs! There’s good news for my US readers as they are sold in the US now, but for other countries it might be harder to get your hands on them….no worries though, we are here for you. gothic rock, punk fashion brand Drug Honey opens shopping site. 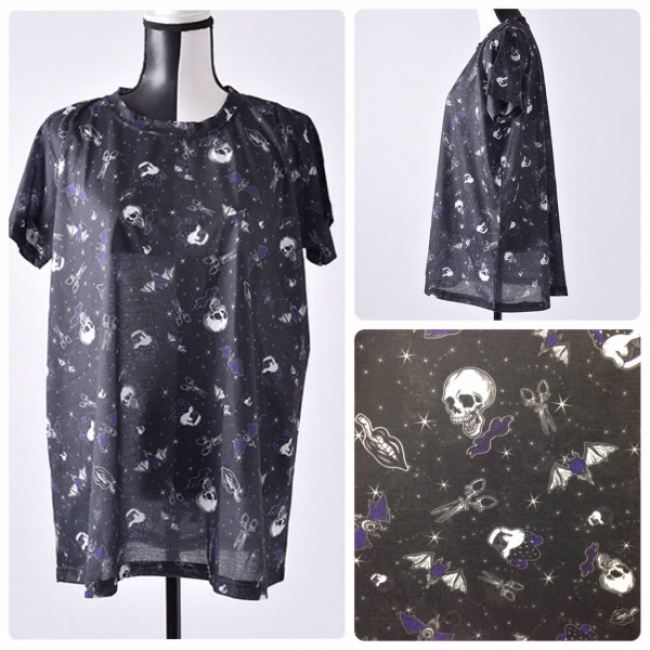 Unisex Goth inspired fashion has been around for some time, but it always has had a certain target group, you are into goth or you aren’t….putting you in clear social box. What if you are a person who likes certain aspects of goth, but doesn’t want to be mistaken for a goth? What if you feel goth but don’t want to be labelled as such? Who likes labels anyway, the people who label other folks do this with a sense of superiority, making them narrow minded individuals in my opinion. Drug honey’s designs have a very strong Gothic flavor, but combine them with another style piece of clothing and see them transform into their own unique style! Their designs are truly classy and the fabric and design hides the fact that these clothes carry a relative low price tag. Well enough bla bla bla, let’s have a look. Nobody knows the concept of uniformity better than the Japanese, but through these new fashion brands, brands which carefully tip toe between several styles they are given the opportunity to rebel against that, and adopt the look they feel best represents them, not how society expects them to represent themselves….